Founded in 1858, we've been serving the community through worship, music, and social outreach. ​We are a community of open minded people, firmly grounded in our community. Come and see how you can fit in. The Episcopal Church of the Good Shepherd is a reconciling, affirming and inclusive Christian community working through worship, love, and service to welcome all people just as God created us. We strive to live by the message of Christ, in which there are no outcasts and all are welcome. No matter where you are on your journey of faith, and whether you are single, married, divorced, separated or partnered, our welcome knows no boundaries of age, race, ethnicity, culture, gender, creed, sexual orientation, economic condition, and physical or mental abilities. We believe that God delights in the diversity of all creatures and so do we! 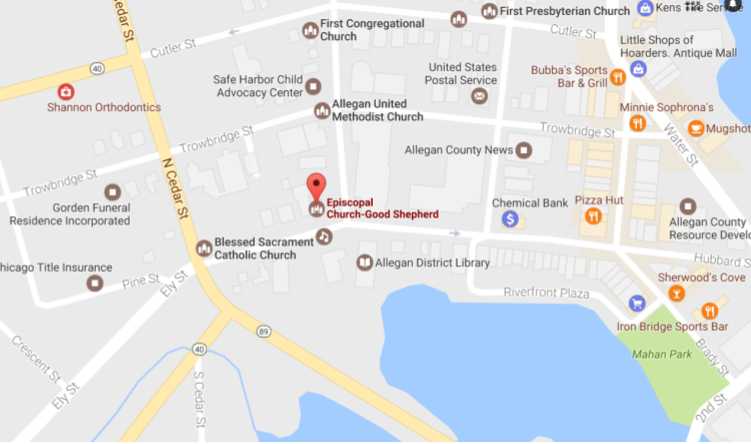 We are located in picturesque downtown Allegan, Michigan on the banks of the Kalamazoo River. From our humble beginnings, meeting in the basement of the old county courthouse, through the construction of our beautiful neo-gothic church, and on into the 21st century, the Church of the Good Shepherd has welcomed individuals and families to worship, to pray, to celebrate and to mourn for more than 150 years. Our worship is rooted in traditional liturgy. The Episcopal Church is known for it's forward thinking and openness to differing opinions and lifestyles. We are a quietly meditative, sacramental and worship oriented church that promotes thoughtful debate about what God is calling us to do and be as followers of Christ. We are a part of the Episcopal Church and of the worldwide Anglican Communion. We celebrate our unity in Christ while honoring our differences, always putting the work of love before unity of opinion. Some of our parish activities include, Soup Supper Lenten Discussions, the annual Parish Picnic, the Blessing of the Animals on the church lawn to celebrate the Feast of St. Frances and Advent activities to name a few. Our food booth at the Allegan County Fair has been a tradition since the 1940's. We have a place for everyone's talents at the Church of the Good Shepherd.